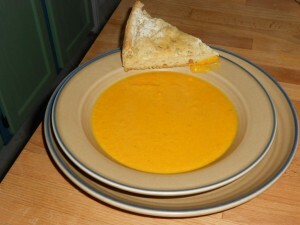 C is for Carrot-Ginger Soup . . .
Here’s a great way to eat more carrots and enjoy a sunny bowl of goodness on a cold January day! Heat the oil in a big soup pot. Sauté the onions over medium-high heat, stirring occasionally. When the onions start getting tender, add the shredded carrots. After a few minutes, add the potatoes, ginger, and cashews (if using). Cook and stir for a few more minutes. Add the salt and whichever of the other spices suit your fancy. Once the spices start releasing their aromas, stir in the stock and the orange juice (if using). Bring to a boil. Simmer over medium heat for 30 minutes, or until the veggies are all tender. Purée using immersion blender, food processor, or regular blender. Many recipes for carrot soup add some dairy (plain yogurt, half-and-half, sour cream) or coconut milk either at the end of cooking or when serving. It will help cool the spicy punch of the curry. I’m avoiding dairy so I omitted it, but feel free to add some if you are able. The soup tasted fine without it. Heat the oil in a big soup pot. Sauté the onions over medium-high heat, stirring occasionally. When the onions get tender add the carrots and celery. Cook and stir for a few more minutes. Add the potatoes and garlic. Cook and stir. Add the bay leaf and spices. Stir to release aroma. Finally, add the water. Bring to a boil. Lower heat to a simmer and cook for 1-1/2 hours. Cool. Strain out the vegetables with a slotted spoon. Place 3-4 layers of cheesecloth in a strainer and strain the stock. Makes 2 quarts. Store in frig, use within a few days, or freeze. Most of the time I want a clear stock, so I remove and discard all of the vegetables. Occasionally, I leave some of them in and purée the stock rather than straining it. If you do that, remember to locate and remove the bay leaf first! P.S. The focaccia in the photo was made using the recipe in Annalise Roberts’ Gluten-Free Baking Classics, 2nd Edition . . . an excellent source for recipes for GF baked goods. More on my GF baking adventures in a future post. This entry was posted in Recipes, Vegetables by Highly Sensitive Girl. Bookmark the permalink.